Five years ago, I ran into a former coworker outside a supermarket. He held his hands behind his back and walked with his head down. He was bent over and struggling to get into the market. I greeted him and asked what had happened to him. He told me that he trusted me and to tell him what could help. I then told him much about Dafa and the CCP’s persecution of the practice. I told him that the Tiananmen self-immolation was a hoax as part of a propaganda campaign, that the regime harvests organs from living practitioners for profit. He immediately agreed to quit the Communist Party. I ran into him again a month later. He was standing straight and pushing a bicycle. He greeted me as soon as he saw me and said that his back was normal. My husband visited a couple, Mr. Xue and Ms. Tian, shortly before the September 2010 mid-Autumn Festival. Mr. Xue was diagnosed with heart disease and had plaque buildup in the coronary arteries. One of the symptoms was angina, which is sharp chest pain due to reduced blood flow to the heart. During these episodes, he also could hardly breathe. He was miserable. Mrs. Tian had pain in her lower back and legs and needed to take a lot of medication. Sometimes, she was in so much pain that she cannot do her household chores. The couple immediately sat down and read the materials he handed them. They were so preoccupied that they forgot that their visitor was still there. My husband asked them to quit the Party, and they agreed. On his way out of their home, my husband asked them to share the information with their children. My husband ran into the couple three weeks later. Mr. Xue said, “Brother, the information you gave us is extraordinary. Since I quit the Party, I haven’t had an angina episode. I owe you many thanks.” His wife had also recovered. Before he left, they told him that they had gone back to work. Mr. Xue came to our home two months later and gave us the six names of his children and grandchildren. They all wanted to quit the Party and make sure that their quitting the CCP would be recorded. 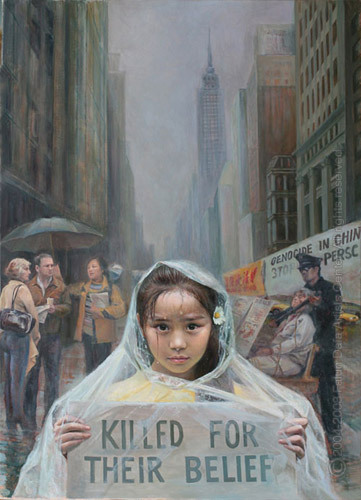 (Minghui.org) I have told many taxi drivers in my city about Falun Gong and their reactions vary. Some drivers kept quiet, but as soon as they heard that terminating their memberships with the Chinese Communist Party (CCP) and affiliated organizations could save their lives, they immediately agreed to quit. Other drivers listened, chatted with me and agreed to quit the CCP. They said they would tell others about the persecution of Falun Gong. Some drivers were touched after they had listened to me talk about Falun Gong and refused to charge me to show their appreciation. Then, there were drivers who were fearful. They disagreed with and even argued with me. I would send righteous thoughts and hoped that they could have a chance to hear about Falun Gong from other practitioners. A taxi driver that I invited to come to my home for dinner refused to come. I was touched by his integrity and chatted with him. To my surprise, he knew about Falun Gong issues, including the organ harvesting from living practitioners. I asked if he had quit the CCP. He said not yet and asked me how to quit the Young Pioneers and the Youth League, two affiliated associates of the CCP. I told him that I could help him quit with an assumed name. He gave me his real name and said that he knew practitioners were all good people. I told him that the CCP was based on violence, which was opposite to the Falun Gong principles of Truthfulness-Compassion-Forbearance. If our entire nation practiced Falun Gong, the CCP could no longer fool the Chinese people. It was a snow day and I was in a hurry to get to work, but could not find a taxi. A driver offered a free ride, but joked that I could give him a million yuan or a BMW. He was a driving instructor for big cars and he was very upset with the vicious behavior of police. I told him to quit the CCP, which could save his life and was a greater treasure than a million yuan or a BMW. The driver instantly agreed to quit and thanked me. I saw a CCP party flag and one national flag behind his windproof glass. I told him that one of my relatives was also a driver. His car had this flag and was scratched by another car. A fortune teller told him that the flag was dyed with blood and was soaked with death, which brought him bad luck. I also told him that the CCP had launched all kinds of political movements and had persecuted 80 million Chinese to death. The flag was dyed with those people’s blood and could bring bad luck to the car owner. The driver immediately said he wanted to throw them away. I said I could help him. He gave me the two flags. I took them, got out of the car, and destroyed them near my work unit. I got into a taxi one evening and saw a man in the back seat. I talked to the driver about Falun Gong, but did not mention that I was a practitioner. The driver agreed to quit the CCP. I thought the person who sat behind me also heard what I said and he should not be left out. So I asked his opinion, did he also agree to quit or not. The man said he was a policeman with the Domestic Security Division. I held no fear and continued: “Must you guys join the Party then?” He smiled and said he only joined the Young Pioneers and the Youth League. I offered him an assumed name and he also quit. (Minghui.org) More and more people in China are beginning to see the evil nature of the Chinese Communist Party (CCP) and have rejected its rule. Many of them have also extended their support and kindness to Falun Gong practitioners, a persecuted demographic under the Party’s reign. Many of these people have been met with blessings. Here are a few of their stories. (From China) I was walking past a store when the owner stopped me. He asked if I had any Falun Gong materials on me. I knew this store owner very well, and would give him Falun Gong materials often. I told him that I had the new set of Shen Yun DVDs and gave him a copy. He asked for another. I gave him two, but he still wanted more. I told him that I really couldn’t – I had other people to give these DVDs to, and couldn’t afford to leave too many in one place. On another day, I was approached by a girl in her twenties when I was trying to give a young man a Shen Yun DVD. She asked for two copies of the DVD. After I gave her two copies, she asked for two more. She nodded firmly and asked for more again. She said that all her friends were asking for them, so I gave her several copies. The young man, who was hesitating before, quickly accepted the DVD after he saw this and also withdrew from the Chinese Communist Party (CCP) and its affiliates. My mother is a Falun Gong practitioner. She told me to recite “Falun Dafa is good” or “Truthfulness-Compassion-Forbearance is good” whenever I encountered danger, and that Master would protect me. In the spring of 2010, when I arrived at a construction site with a cement truck, I needed to find someone in a temporary structure. Just when I stepped in, the structure collapsed. I checked myself afterwards and found no injuries, not even a scratch. A person deeper inside the building had died. I want to thank Master Li for saving my life. My mother told me that everything has a soul. So I talked to my old car and asked it to remember “Falun Dafa is good.” every morning. The car now runs really well. I have told my story to many friends and relatives. I asked them not to believe the government’s propaganda, but to believe the Falun Gong practitioners’ words – withdrawing from the CCP truly does save lives. I initially withdrew from the CCP and its affiliates with a fake name. Now, I want to change my announcement to my real name. I am no longer afraid of the CCP’s retaliation. Master Li has saved my life, and I am eternally grateful. My wife’s store was next to a cell phone store, and I was acquainted with the store owner. He was a military veteran and fond of singing. I gave him Shen Yun DVDs, the Shen Yun Chorus DVDs and DVDs of the Nine Commentaries on the Communist Party. When the county government organized a chorus to sing CCP songs in 2011, the officials had repeatedly invited him to join. When I visited a township, I met a mid-level official. I talked with him about the CCP and tried to persuade him to quit the Party. The Chinese media have reported this, but they have cleverly cropped out the last two words and only mentioned “The Chinese Communist Party.” I asked him to go visit the location of the stone and see it with his own eyes.